University student Edith Burgess wrote to acting chancellor William G. Hastings noting that she takes classes with G.W. A. Luckey and he has never shown disloyalty. 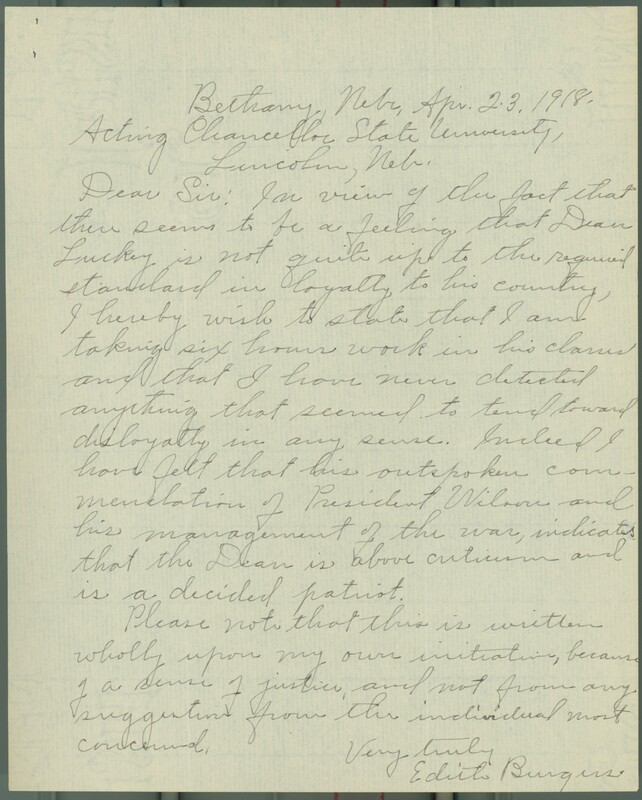 In view of the fact that there seems to be a feeling that Dean Luckey is not quite up to the required standard in loyalty to this country, I herby wish to state that I am taking six hours work in his classes and that I have never detected anything that seemed to tend toward disloyalty in any sense. Indeed I have felt that his outspoken commendation of President Wilson and his management of the war, indicates that the Dean is above criticism and is a decided patriot. Please note that this is written wholly upon my own initiation, because of a sense of justice and not from any suggestions from the individual most concerned. 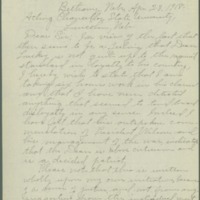 “Letter, Edith Burgess to Acting Chancellor State Univeristy,” Nebraska U, accessed April 25, 2019, http://unlhistory.unl.edu/items/show/196.